Give me 5 minutes to let (relaxing music + scene lights), relieve your pressure, massage your dull mood then cheer up your heart. Fairy tale dream crystal-like music light carving world, ignite the joy of warm light in the night. Let the home space is filled with warm sound atmosphere of happiness. Can use car DC12V, suitable for outdoor camping, party use. 6 relaxing music, let you relieve stress, cheerful mood. Let you see, hear and feel the dynamics of sound. The world's unique Bluetooth speaker/light, still works when offline. 1) Enjoy 6 relaxing music. 2) Set sound/light awaking alarm. 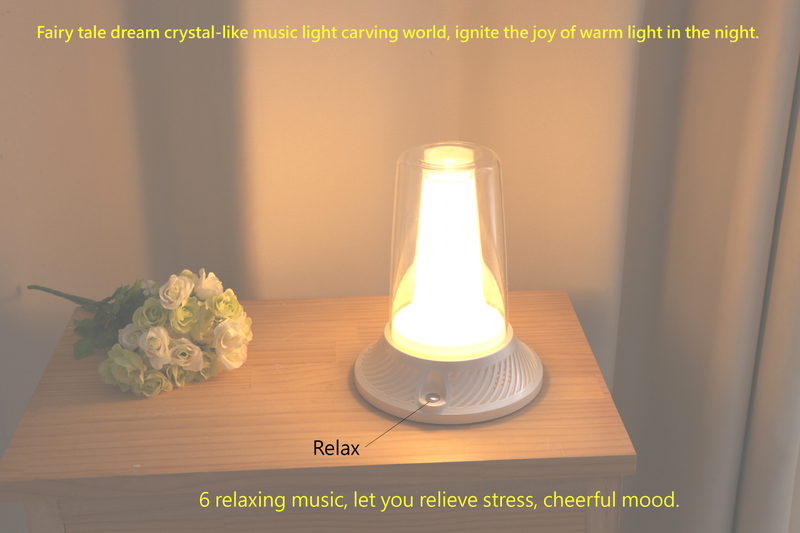 World's first multi-sensory Bluetooth speaker with scene lights and relaxing music. * 6 relaxing music, let you relieve stress, cheerful mood. * Make the space of home full of warm and happy atmosphere of sound and light. * Enjoy the atmosphere of happiness in shimmer, and also let you meet the fairy tale dream. * No matter in house or outdoors you can see/ hear music and light show, this could cheer up your mood. * Whether at home, or see / hear is music, outdoor light sculpture show, and as alight. 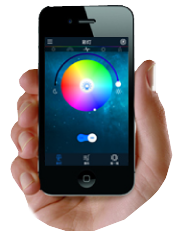 * Set a " Shake " fun for Play/Pause, Next song, Close/Open light, Random color selection. * No need to change the color of the home paint, direct change it with the way to change the home atmosphere of light. * Even disconnected Bluetooth it still audible relaxing music alarm clock function. * The light is no longer a fixed plate of fixed color, as long as you like today's indoor lighting, just adjust it to a romantic atmosphere of pink! * Sleep Assistant - Helping sleep music/ light could set sleep time by countdown 10, 20, 30,60, 90 minutes. * 5W speaker delivers precise highs and crisp clear sounds with deep bass. * App is available for both iOS and Android devices. * DC 12V/1,000mA adaptor included. * This product has a number of patents and music creation. * This product is designed in TAIWAN and assembled in CHINA.